This is Day 4 in a series. You might want to check out the previous day, or start at the introduction. Zelda games are Zelda games. Every game follows the same basic formula. You start off as Link, a humble boy just starting off his life. After a long intro sequence, you get a sword and shield, and you go off on a short quest that quickly becomes so big that it entangles the entire world. It also somehow involves a princess named Zelda. You have an initial task of visiting three dungeons; after that a cut scene plays moving the story forward and revealing more about what you must do to save the world. You go to several more dungeons before finally confronting the end boss and saving the world. However, just because you know exactly what's coming in terms of formula, that doesn't make the game any less enjoyable. In fact, because I am so familiar with the Zelda formula, whenever it deviated from the path, I was actually pleasantly surprised. For example, the first three temples usually go in the order forest, fire, water. In Skyward Sword, the first temples go forest, fire... sand. It completely threw me off, which was nice. One of the biggest improvements in this game from the other ones in the series is the fleshing out of the relationship between Link and Zelda, giving Link a clear motivation. In Twilight Princess (the previous game in the series), the relationship between Link and Zelda is practically nonexistent. She's an imprisoned princess who is rather disinterested in you, and not even your love interest. In Skyward Sword, Zelda isn't a princess. She's your childhood friend, and you both definitely have a crush on each other. Link and Zelda are way too cute together! You live in a floating city above the clouds. One day, fate happens, and she falls through the clouds down to the ground, where no one has set foot before. Your motivation is to find Zelda, your love interest. Of course, saving the world somehow comes into play with that, but your primary motivating drive is finding Zelda, even if you are the hero of destiny. The thing about RPGs is that typically, you grow stronger throughout the course of the game. You can gain experience points and levels (Skyrim), or you gain new items and equipment (Skyward Sword). I love this system, because it gives the player the feeling of progression: like they are actually accomplishing something. It gives the feeling that all that time invested was actually worth something, not wasted. Zelda games tend to do this well, but Skyward Sword does it better than the others. Not only is there the usual system of "every time you enter a new dungeon you get a new item," but in Skyward Sword, items are not final. In previous Zelda games, once you got an item, it stayed the same for the rest of the game. In this one, there is actually an upgrade system. You can collect materials and take them to a shop, and then upgrade your equipment and items, making them stronger, or faster, or just all around better. It's very satisfying, being able to think that all of those materials that you spent time collecting were actually worth the effort. All that to say, the motion controls are actually fantastic. The accuracy is great, and the new found accuracy is incorporated into the game in enough ways that I can say it is not a gimmick. Combat is just one of the ways that it is integrated. Flying around on your bird is completely controlled by motion: you tilt the Wiimote to turn, and flick it to flap your wings. Breaking pots to get money has always been a running theme in the Zelda series, and the motion controls have made it even more fun this time around. Not only can you throw pots overhand to break them, you can also hold the Wiimote low and actually roll pots like bowling balls. It's kind of like a mini-game, but even more pointless. 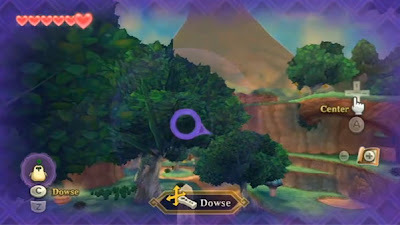 The other main use of the motion controls is the feature called dowsing. This is like dowsing for water, except you look for different targets. To dowse, the camera switches to a first person perspective and Link points his sword out in front of him. You then point the Wiimote around, and look for where the sword reacts the strongest, and walk in that direction. For the first long time, dowsing is almost useless. The targets that you can choose are all boring or main quest related. However, eventually you gain the ability to choose different targets, some of which are actually useful to have, and dowsing becomes an enjoyable thing. 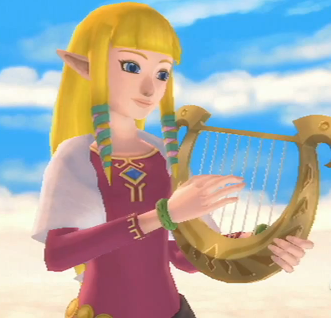 Anyhow, Skyward Sword has a harp. You would think that with the advanced motion controls, the harp would be super cool to play. Unfortunately, that is not the case. In all of the other games, you could play the notes that you wanted to, even if it wasn't an actual song in the game. The songs would then have a super cool effect, like slowing down time in Majora's Mask, or changing the wind in Wind Waker. In Skyward Sword, all you do is hold down A and swing your arm back and forth in rhythm. You have no choice over the notes. Not only that, but it only has an effect at certain locations, and it usually only gives you items or crafting materials. I'm quite sad by this turn of events. Of course, it wouldn't be a Zelda game without an annoying companion to bug you every couple of minutes with really obvious information. Fortunately, the companion in this game isn't as annoying as Navi from Ocarina of Time. I'm not usually bugged by the one in this game. The one exception is when she draws attention to the fact that the batteries in the Wiimote are low. Not only does this break the fourth wall, but it also takes a long time to read the text (which you can't speed up). If you try to ignore it, it will blink at you every time you enter a new room, and if she ever has something important to say, you won't notice. She tells you multiple times per play session, and she starts telling you long before you actually need to change batteries. They could easily have made her less annoying, but I guess it's not that big a deal. One of the biggest complaints that I've heard leveled against the game is that there is an awful lot of backtracking, which is completely true. However, I don't find it to be a bad thing. Yes, you visit a lot of the same locals, but each time you come back, you've grown. You have some new item or power, so you can access areas that were previously blocked off where you wondered what was there on your first trip. 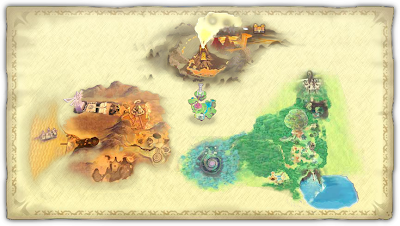 Where I am in the game, there are only three places to go, plus the hub world. It does kind of make the world seem small. The world in Twilight Princess seemed much larger, what with it's massive fields that needed to be traversed by horseback. It also seemed much emptier. Skyward Sword has lots of stuff packed in much closer, so there is less area, but there is actually more to do. I think that it's well worth it. The World Map. Pretty, isn't it? The compactness of the game means that the side quests are a lot more prominent this time around. In previous Zelda games, I have had a hard time even finding the side quests, which were more put in as novelties. In Skyward Sword, they are much more exciting. The fact that the hub world is up in the sky, so far removed from the rest of the locations with the dungeons helps it be much easier to find the side quests. They all start up above the clouds in the town. In terms of collectibles, there are chests scattered around on little islands in the clouds. The only way to unlock them is to find cubes on the ground, and hit them with your magic sword. This is actually quite fun to do, to see a cube and try to find the way to get close enough to it to hit it. I've spent many an hour simply hunting cubes. The Legend of Zelda: Skyward Sword is a wonderfully crafted game. A lot of thought was put into the level design, and the Zelda formula, although old, has aged well. It is still fun to play through, and there are enough differences to keep it fresh. If you like tightly scripted stories or the generic hero's quest, I recommend this game to you, as well as if you like clever motion controls or RPGs in general. Or if you just want to play one of the most talked about games of the past year. That works too.